We've decided not to use the real names of the people we meet and talk with; we're almost entirely going to be using aliases. I realize it wasn't smart before and I hope this corrects it. I just don't want people to think everything they say to us will become a blog post with their name stuck on it. It's not fair to them, and besides we want friends here, not “subjects” to write about. So that said, let's have some fun today! I'm constantly reminded of how different life is in the islands. Some of it is expected, some of it is a surprise, and some of it is simply unexplainable. We've talked about island things that are universal and maybe all of these are. We've been to Grand Cayman, an island in the Great Lakes of Canada, a couple of the Hawaiian islands, a couple more in the Bahamas, two more in Honduras, one in Belize, and now a couple of Puerto Rican rocks. So it's not as if we have broad experience with dozens of island countries, but we are happy to discuss our own experiences. We have been settled in to our rental house for quite some time now, it's very comfortable and the neighborhood is great too (middle class, mostly locals). It's just around the corner from one of the best small groceries around (Colmado El Encanto) and believe me, that place has everything. Every time I go in there I see something new (fuses for cars, light bulbs, tools, medicines, electrical connectors, kitchen utensils, household) besides the normal food, beer, liquor, etc. and of course it has the bar. Our neighborhood is close to hardware stores and the island's version of “fast food” (chicken and burgers). It's a 15 minute bike ride into town on a bit of a busy road but that's actually not bad at all, we like the ride. We wish our place was a little closer to more beaches, but you can't always get what you want (but you can get what you need!). Also, if you have a car, every beach is close! In the slightly larger picture, what about the rest of the island, how are we settling in to that? A few weeks back, one of our stateside transplant friends told us, “You don't choose the island, the island chooses you”. Now this was over drinks, so take it with a grain of margarita salt, but I do think the island is starting to accept us. The soul of this island is pulling us in. This rock has a soul! Some local friends we met in the Colmado bar invited us to their nephew's birthday party on the beach. We had a great time and they even drove us there and back, since we remain car-less, very nice of them! 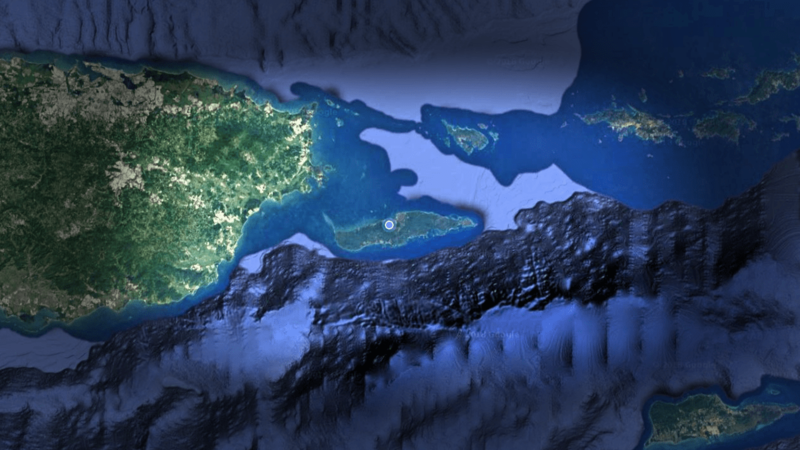 The father of the birthday boy is from St. Croix, and he talks about Vieques as his true home. He says when he goes back to St. Croix his Mom says “welcome home” and he tells her no, his home is in Vieques. 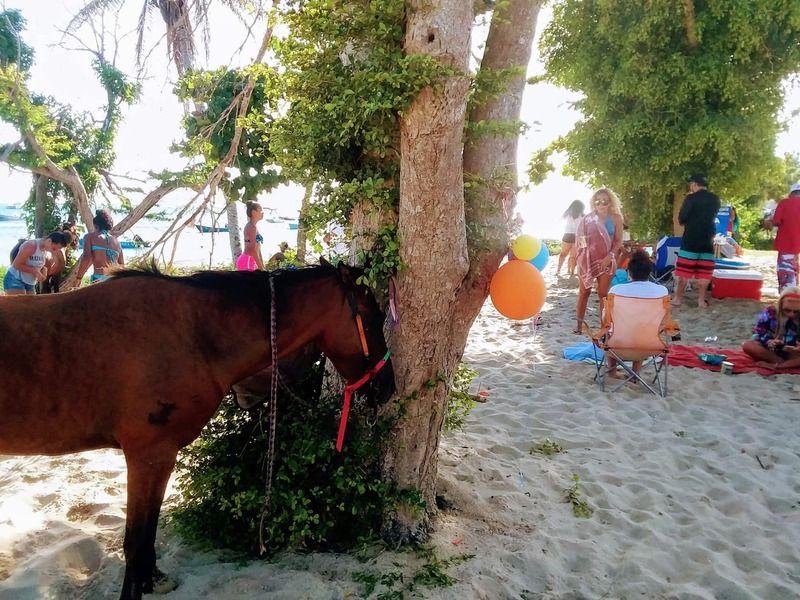 He's the second person who has told us how much they prefer Vieques over St. Croix. 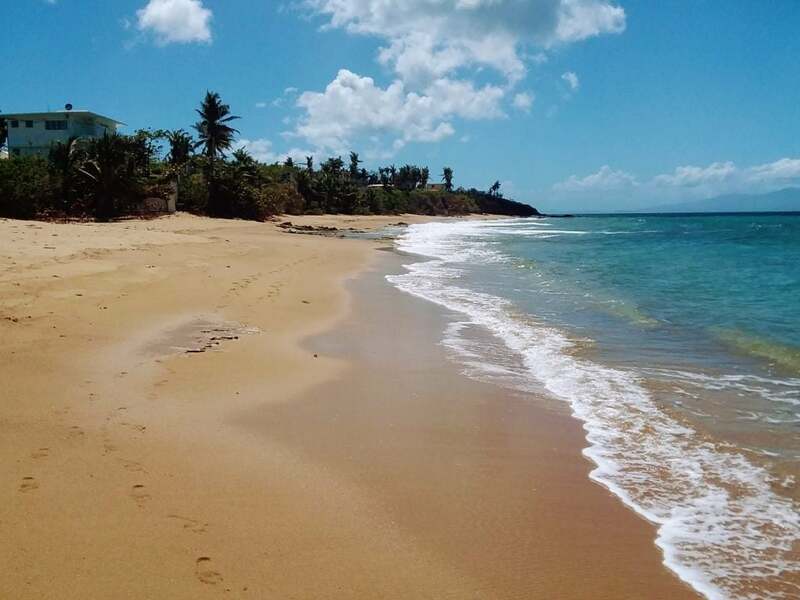 We haven't heard anyone say they'd rather be in St. Croix over Vieques, but that's probably because those people are in St. Croix! 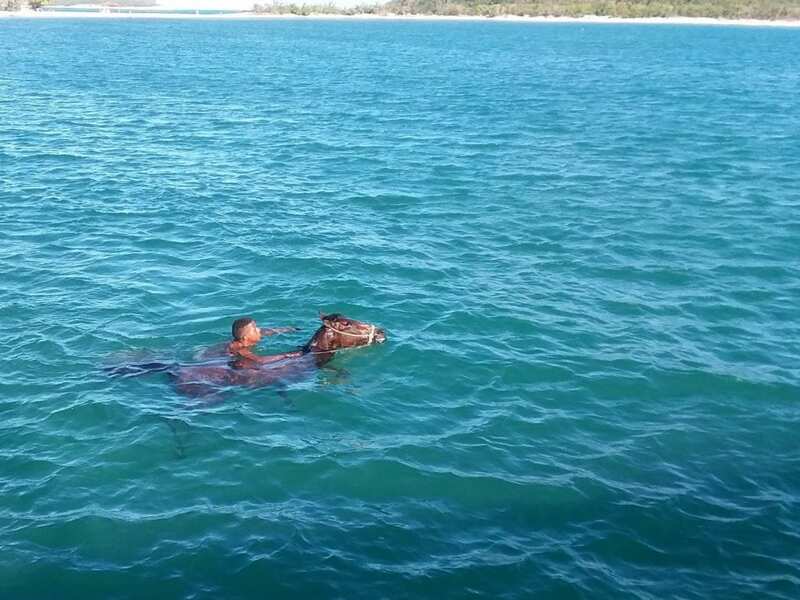 Ride your horse in the sea! We just had an experience that in retrospect we had to laugh about. An office in town called us and said they have some paperwork for us to pick up. We said thanks, we'll come and get it. We rode our bikes to town, getting there at about 2:30pm only to find a sign on the chained and padlocked door that said they're open from 8a-5p. I didn't want to be grumpy but I got a little grumpy at this. We did run one other errand before heading home, where I checked Facebook. On their page it says they're open from 9a-4p. Hmmph. The next day, we decided to go back, but this time in the morning. We called them to make sure they were open and then hopped on the bikes and wheeled into town. We rolled up to the door, same chain, same padlock! So we called them on the phone and asked if they had moved. No, we're still right here, two doors down from the bakery. Two doors down, not one door down? That's right, the green metal grates. Wait, not the black metal grates? We'd gone twice to the wrong place, and both times we were 20' away from where we should have been! On the way out, the lady told us, "Have a good day, don't get lost!". The moral of the story is that sometimes it's not an island thing, it's a “between our ears” thing! I did have a surprise success in buying a couple of cases of expired beer over the last couple of months, at the warehouse store. My theory was that they would eventually restock with fresh beer. My fear was that they would just restock with old beer from some other warehouse. Well, they actually restocked with fresh beer! Yay, I win! I never actually could detect any taste issues at all with the older beer, probably because as my friend Pete pointed out, they were all IPAs. IPA is India Pale Ale, originally brewed with higher alcohol and more hops to withstand the long journey from England around Africa, all the way to India. I guess these beer recipes did the trick as well, getting them to me from the brewery by truck to an east coast shipping port, over sea to San Juan, by truck across PR to Fajardo, by ferry across the water again to Vieques, and then by truck to the warehouse. I also worked with a local bar owner to bring in a fresh case of local beer from mainland PR. This was a small garage brewery called F.O.K. 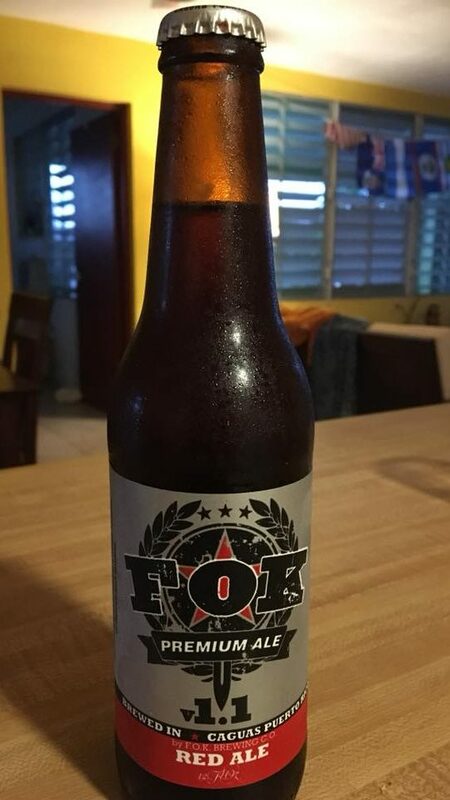 (Fresh Off the Keg) who has a deal with a big PR distributor, so we got to try their beer in Vieques, another win! I'm not volunteering for that duty but the Pyle Itch Index says that no-see-ums are a 1 (minor, short-lived itch, unless you have dozens of them, which can happen), mosquitos a 2 (itch ranging from annoying to really annoying, but usually only lasting hours and maybe recurring a little over the next day), fleas are a 3 because they "saw" into your skin, push a needle in, and and then start sucking - it gets the histamines fired up! (we actually haven't gotten a flea bite here - the dogs are treated so if they get a flea, it dies) But the ants around here are a 4+, at least, with the dual action bite/sting from their mandibles to hold on and poison injection from their abdomens! They hurt for a few minutes (Pain Index 1) and then it goes away. At this point, you think you've been spared, but you haven't. Wait until you're in bed a few hours later, under the sheets. That's when the site starts heating up and swelling and the itch starts, and it doesn't let up until you make yourself bleed! I don't know how high the Pyle Itch Index goes, and I hope I don't have to find out. I can say, we're learning where not to walk in the yard. No infections yet though – scratching seems to work just fine! Another thing we're starting to learn is that if you get one thing done in a day, it's a good day. It doesn't matter if your to-do list is 5 items long, 1 success is a good day. We've had many of these good days, except the list didn't shrink because something else got added to it. But you have to, you simply must enjoy the small victories! The day we finally got our paperwork after the informative phone call, we scored 4 things in a row, and hurried home before we could mess it up! Speaking of messing it up, we finally got in touch with a group that's doing aluminum, cardboard, and plastic recycling, yay! They were down for months after the hurricane. But they came and collected a couple of weeks in a row. Unfortunately, the second week the trash men beat them to our outside recycles, grabbing our bright blue recycling can and dumping it in the truck with all the rest of the trash! It was too late - before we knew what was happening they were already moving on. We did put out the rest of our recycles from the house and the recycling people came and got it. They said they need to talk with the trash people. Here's hoping they get it together and quit messing it up! More good news, we found a new beach! We think it's called Playa Cofi. 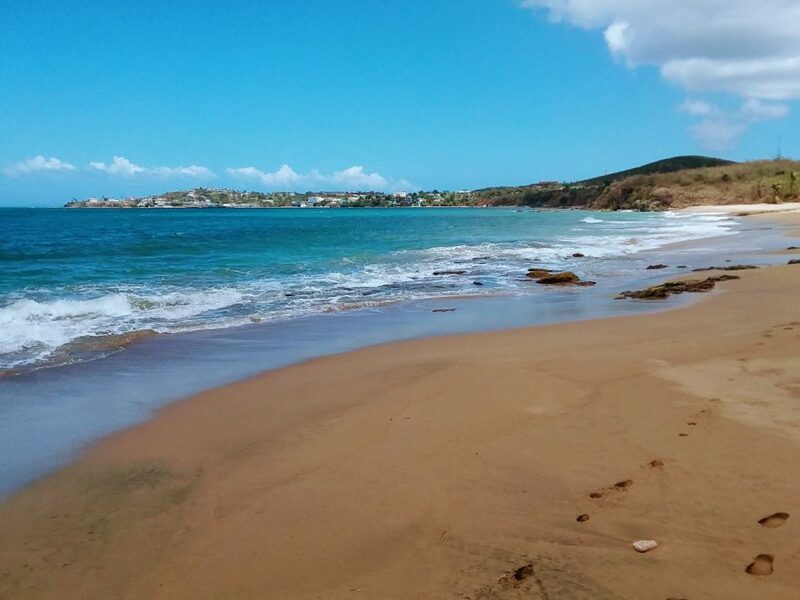 The sand is reddish colored and there are great views of the mainland mountains, the harbor in town, the ferry dock, the homes and businesses up on the hillside. The beach is a few hundred yards long and is nearly deserted (one lone guy walked down the beach the first day we were there). We find lots of seaglass and Deb makes pretty artwork from it. We walk the sand, climb the rocks at the ends, and sit in the tidal pools, buffered from waves by a line of rocks. I didn't think we could swim it until I saw two teenage boys snorkeling there on our second visit. I don't know if I can fish it because I may just catch a bunch of those rocks, but I'm going to try. And if not, it's beautiful nonetheless. But the best part of this new beach is that it is a very short bike ride from the house! The closeness makes it so accessible that we could go there every day if we wanted. Feet in the warm sand and the cool water, you can't beat it. It really connects our souls with the island. TODAY'S SPECIAL: Quiet Your Mind, by Zac Brown - Enjoy the ride! Hey Norm, I have been enjoying your blog. 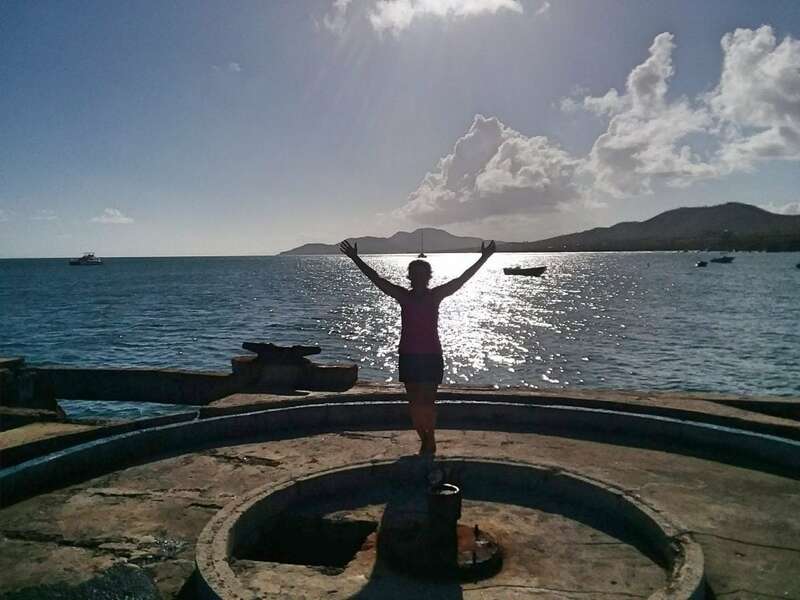 My husband and I have “almost” bought a house in Vieques a few times but it never happened so far. We haven’t been on island since before Maria but hope to get back sometime in the next few months. In the meantime, keep those blog posts coming so we have a bit of confidence we haven’t lost our minds by retiring in Isla Nena. Linda, thanks for keeping up with us! Can’t wait to meet you here. We will definitely keep the posts coming – I definitely don’t think you have lost your minds, because if you have, so have we! She was being nice that’s for sure. We’re figuring out these things as we go, thanks for helping us! I swear my blood pressure drops a little bit, each time I read one of these posts! SO.. So.. what did you say u used to do? Rescue projects from Dumpster Fires? LOL :-).. Agree with Kevlar above.. wonderful to see a new blog post appear.. Looking forward to checking out the beaches with you and Deb!! That sounds like a plan Lizzy!